Plastic is becoming a mega concern world over as the land and oceans are getting littered with this ‘we love to use it so much’ product. Low production cost, easy to manufacture, versatile,impervious to water, easily moldable, has made this product so popular world over that its used right from pins heads to space ships. Its replaced wood, metal, glass, ceramic, paper, stone, leather etc. However, misuse of plastic has caused it to become as one of the major environmental threats to the world. Its alarming that minute particles are making their way to our food. Both land and sea animals are ingesting plastic and this in turn is landing up on our plates. You might be wondering why am I talking about plastic here instead of food. Well, as some of my ardent followers know, my blog is not just for recipes but its also where I share news, my experiences and events. From Monday 28th August 2017, Kenya put into action its total ban on plastic bags. A grace period of few weeks was given to the citizens but from now onwards anyone who will manufacture, sell or use plastic bag will be sentenced to jail for 4 years or will be fined $40,000/- Its one of the world’s toughest law on plastic ban. Other African nations to ban plastic bags are Rwanda, Tanzania, Eritrea, Mauritania and Morocco. I’m all for this ban on plastic bags. I remember years back when my father in law would go to the market to buy fruits and vegetables, no one would give plastic bags. Everything was dumped into the baskets and we would separate it at home. Or sometimes he would carry the cloth bags. Whenever I used to shop at the supermarket, I would insist that I didn’t want plastic bags and I’d get stared at. It will take a while for the Kenyans to get use to without plastic bags but already people are finding alternatives. Women who weave beautiful baskets or kikapus as they are called, will now earn some money for their handicraft. Today’s Protein Rich Dish is a quinoa lapsi. I had to share a Gujju recipe for this Mega Marathon. However, I’ve already got the usual dokhra, kadhi, khandvi, handvo on my blog so had to think of something different. The whole idea came about when I was craving for some lapsi which I simply love. However, I didn’t have any dalia or cracked wheat at home and then I thought why not use quinoa. I’m so glad I made this lapsi with quinoa.I loved it. 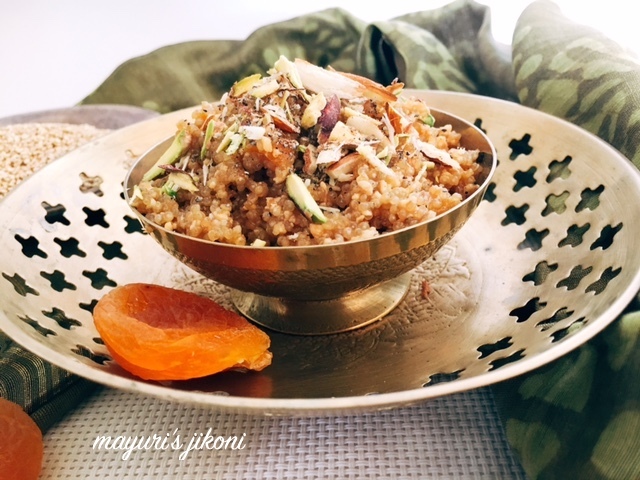 Since a lot of people now use quinoa on fasting days, this lapsi is surely a sweet treat. Lapsi is a typical Gujarati sweet made from cracked wheat or dalia, stir fried in ghee. Water is added to cook it and lastly sugar, nuts and cardamom powder are added. We usually make lapsi on auspicious days. I added chopped dried apricots as its the only fruit that is rich in protein. Fresh apricots are not protein rich.I added a bit of ghee to give it that authentic lapsi taste. A bit more healthier than the normal lapsi as in that we use quite a bit of ghee to roast the cracked wheat. Wash the quinoa in a sieve under running water 3-4 times. Add the quinoa into a saucepan. Lower the heat and let the quinoa cook till its done. When little water is left in the mixture add the jaggery powder. Stir till the jaggery dissolves. Add the chopped dried apricots. Cook the quinoa till all the water evaporates. Add cardamom powder and chopped nuts. Add ghee on top and mix and serve hot quinoa lapsi with roti and curry. I love to have it on its own. Adding ghee on top is optional. If you don’t get dried apricot add raisins. I added them to make it into a protein rich dish. Using less jaggery works well for us, but if you want it sweeter add more. We have plastic bags ban in CA too. It's really good and I wish they do it India too. Love your recipe and of course the info that your provide. This sweet quinoa with jaggery sounds interesting. Perfect for navratri. Love this sweet version of quinoa.. Ghee topping indeed makes it more yummy!! What a cool idea to use quinoa for lapsi ! I love this fusion and will try it asap . Here in India too they have kind of banned but they need to take a stern step , but besides government people too need to cooperate . Very interesting write up Mayuri. Here they start and it goes for some time and then they revert back to using plastic as there are no strict laws. Hope it changes soon. The lapsi with quinoa looks so good. What a healthy twist to ta classical dish! We have a ban on plastic bags here but the fine is a miserly 500/- and no one has been fined as yet. Wish it was stiff. The people in the market still think I am a bit crazy because I tell him bag the food in my bag. Anyway I love this lapsi and will make it for my snack later it is yum. Thats a very smart idea to replace broken wheat in Lapsi, cant wait to try this protein packed lapsi soon. Very nice twist Mayuri..thats a good one…and you really spend so much time writing..good to read all that! In Trivandrum, where I am from, they have brought in a ban on plastics. People have gone back to the old age system of carrying clothes bag with them when going for shopping. NEver tried a sweet dish with quinoa that sounds interesting! Quinoa lapsi looks inviting,must be a flavorful one. Anything with quinoa is like a real treat for me. Love reading the intro to all your posts. I learn so much about the happenings at the other side of the world. This quinoa looks fabulous and would have tasted delicious with the apricots. Quinoa lapsi looks like a treat, so delicious 😋. Plastic ban is there in Delhi for quite a few years but still people use and no one fine them. Didn't know that Kenya had such tough laws on plastic bags — wish they were that strict here in the US. Quinoa lapsi looks and sounds delicious.